There seem to be some color problems. The background browns are fading into the Chinese text red-browns (a problem of translucency versus opacity). We'll see how it plays out. I have a few tricks up my sleeve. Thanks! I'm hoping that in context (i.e., at a Serenity con, among hundreds of Serenity fans), the symbol will still be obviously what it was supposed to be! I definitely think it'll be obvious. I can see what you mean about how parts of it seem to blending together a bit, but honestly, it looks fabulous to me. I agree, to those of us that know the pattern it should be obvious. And it looks shiny!! I think it looks amazing. I think it will be covered in drool after five minutes at the con - now there's a lovely mental image. Oooh, now I'm really looking forward to the con! Yup. I agree with sffan. And unlike paints, it'll be a new thing in different lighting conditions. 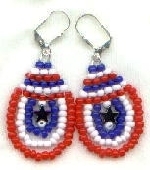 You're right--half the attraction of beadwork is exactly that whole reflection/refraction thing. What I mount this on, and the ambient lighting, will both make a difference in how it looks. There are Japanese beads called Delicas, available in perfectly uniform size, matching finishes (all opaque, all translucent, etc.) and a huge range of colors. The end result is a perfect, almost machine-like piece of beadwork. 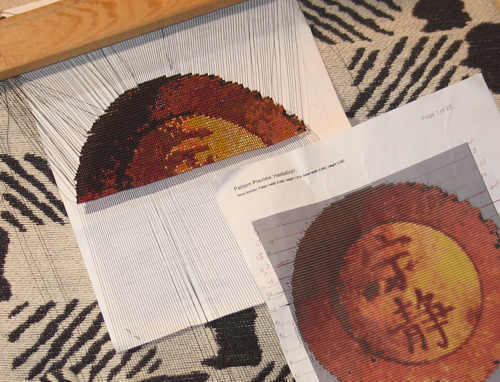 My life would be easier if I'd just give in to Delicas, but I can't help it--I prefer the uncertainties and the more textured, "primitive" look that comes from mixing Czech, Japanese and French beads. 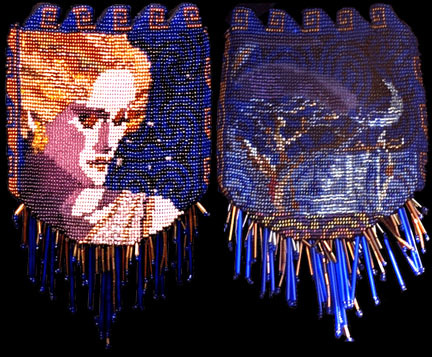 Every now and then I'd hit on the ideal combination of design and palette, and that was what kept me exploring beadwork for so many years. Like just about any craft, it can have some depths if you want it to. Or it can be very, very basic. Like fanfic, you know? "OMG Lex kissed Clark and it was hot liek wo"
"Mulder paced across the roof of Fort Gambaro, the sooty tar paper crinkling beneath his feet, the cell phone at his ear." Garrison scowled, but only because he knew he was wrong; Conner reflected that lunchtime trades had gotten so much easier since Randall had gotten the Full Metal Alchemist DVD set. Watching it on the sly when their parents and nannies were unawares only made it cooler, Conner had told them, and he, Randall, Garrison, and Geoffrey had built a fort out of Randall's couch cushions and watched sixteen episodes in one sitting." *mouth open, eyes all round* Is it okay if I let everyone know I'm in love with you? That was the coolest explaination ever. I realized after posting that comment that I'd failed to note the really salient fact: none of the examples are my own beadwork. They're just random pix off the web. 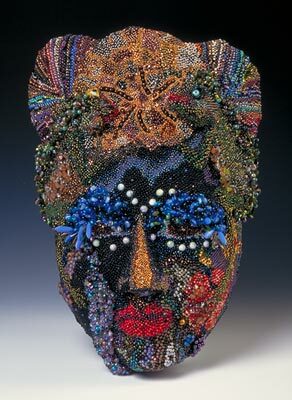 The mask is by NanC Meinhard, one of the greats. 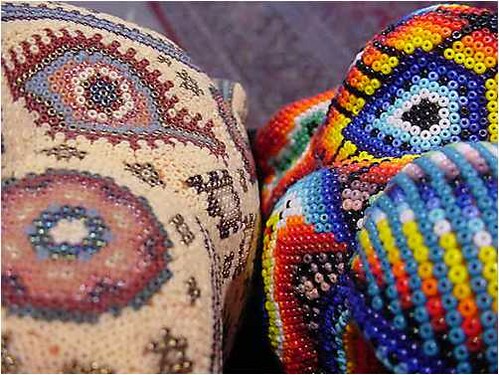 The little beaded forms are Huichol tribal work from Mexico. The earrings are a beginner project off About.com. Thanks! I'd have made some more progress on it today if not for The Continuing Adventures of Adventure Kitty. I love your kitty icon. Is that your actual cat? Cutie McBigEyes!